The smokey eye trend that started towards the end of the 1990s doesn’t seem to be waning but in fact seems to be picking up pace. Almost every makeup brand has a palette that is “perfect for a smokey eye”. I already have two! One by Guerlain which I will be reviewing soon (I love it!) 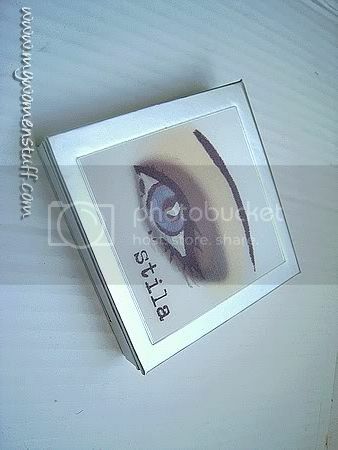 and another by Stila which is the Stila Smokey Eye Quad in Original. I said before that I really like Stila eyeshadows but I did gripe a little about how its hard to find a truly dark colour in the single eyeshadows. Well, the Smokey Eye Quad takes care of that! The quad comes with 4 eyeshadows that are perfect for creating a smokey eye. 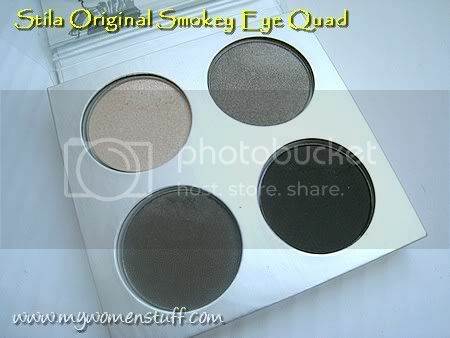 The packaging of the Smokey Eye Quad is sturdy although I found it a little thick for travel. It is cardboard but sturdy cardboard, and the 4 eyeshadow pans in it are slightly smaller than the normal sized single eyeshadows. Still, you do get a lot of product. The eye on the cover is slightly holographic, opening or closing depending on how you angle it. On a slightly gimmicky front, the Stila Smokey Eye quad talks you through how to apply your eye makeup to create the smokey eye look. 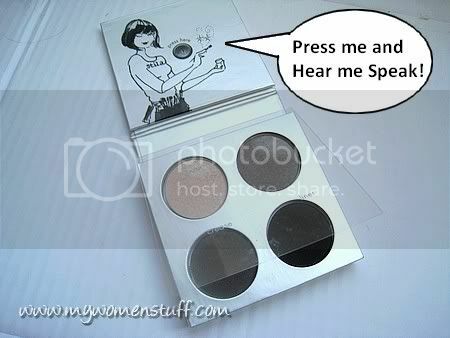 Press the button on the cover and a tinny voice walks you though how to apply the eyeshadow. Unfortunately, it isn’t very loud and it makes references to Stila brushes which I don’t have so I was a little confused. Fret not however, because the same instructions are repeated in the leaflet included in the box! There are pictures of the Stila brushes in question and you can duplicate it with your own similar looking brushes if you don’t have them. The Stila Smokey Eye Quad comes in 3 colour schemes – Original, Greens and Bronzes. This simply tells you that a Smokey Eye does not have to be black but can be created using any colour scheme you wish. In fact, I’m surprised there is no purple quad because purple is the other favourite smokey eye colour I have seen created. The colours in the Original Smokey Eye quad are – Champagne (shimmer), Slate (Grey-taupe with shimmer), Kettle (Dark Grey matte) and Ebony (matte black). I find the texture of these Stila eyeshadows a little different from the single eyeshadows. The texture is harder which means it is less easy to pick up the colour. However, I will not be docking points for this because it actually makes it easier to create a smokey eye! I’ll explain. Because it is harder, the colour you pick up with your fingers or brush is less. So, you have a lower risk of spilling it down your cheek or having colour dropping everywhere. Also, I am not very good with a smokey eye, so I find it easier applying sheerer colour then building it up with layering. This way, I don’t end up with too dramatic a look if I’m not up to it, and I can create a more dramatic look, if I feel like it. how funny that you posted this picture as I just tested all three quads recently and i thought it was strange that stila made 3 smoky palettes. i thought that they tried to grab as many buyers as they could. i think you look good with this quad. but don’t bother with the other two. even that green one was a bit tacky IMO. Ooh just what I was curious about! nice job on your smokey eye! I have yet to try one with success. Maybe I just “need” this palette huh? Heh. I refuse to pay the Malaysia price though. So will find a way to get it somewhere else! The look you created is pretty subtle and you can definitely get away with it as a daytime look. 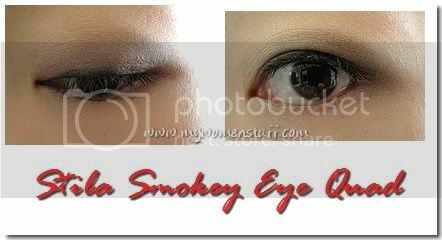 oohh someone created a LOVELY smoky eyes!!!!!! but it’s really weird with the pressing and someone talking for the instructions lol i find that..weird ! lol but I love the color on yoU!!!! @Nikki : Thanks Nikki! The talking thing is really weird but fortunately it stays quiet until you press the button which is something I’m not planning to do frequently! Hmm… I wonder if I can recreate this look for myself? Time to experiment! Hehehe. @Tine: I can’t do the usual smokey eye. I look like a panda that got punched in the eye!